We look at a few extensions that can make your daily work with Firefox more enjoyable and efficient by removing tiny annoyances and adding nifty features. What do the Word Count Plus, FoxClocks, and QuickNote Firefox extensions have in common? They all belong to a category of tools that make a virtue of doing a limited range of tasks well. In this article, I'll cover a few such extensions that you might find useful. If you work with people or companies in other countries or on other continents, a world clock tool can help you better plan your day. The FoxClocks  extension can help you not only keep track of time in multiple geographical locations, but also do it with consummate ease. Once installed, the extension adds a couple of default clocks to the Status bar. To replace them with clocks that show the time in cities you want, use the Ctrl+Shift+Q keyboard shortcut. 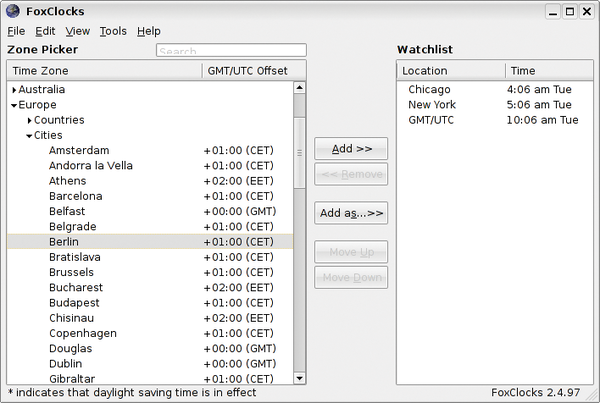 This opens the FoxClocks dialog window containing a long list of continents and cities to choose from. However, you don't have to scroll up and down the list to find the location you need: Just enter the name of the city you need in the Search field, and the Zone Picker window shows the matching results as you type (Figure 1). Select then the found city and press the Add button to add the selected city to the Watchlist window. If the city you want is not on the list, you can add a custom location by selecting a city in the same time zone and pressing the Add as button. To tweak FoxClocks' settings, right-click on a clock icon in the Status bar and select Options. Here you can specify a custom time format, change FoxClocks' position, and adjust the way the extension displays the clocks. Figure 1: FoxClocks puts world clocks in the Status bar. Attaching multiple files to an email message in Gmail can be cumbersome: Click on the Attach a file link, locate the file you want, press OK, then repeat for other files. It might not sound too bad, but if you have to send emails with attachments every day, this procedure can become a nuisance quickly. The dragdropupload extension  provides a fix to the problem. After you install it, you can drag a file onto the Attach a file link to add it to the email. Better yet, you can drag and drop several files at once and use the extension with other websites and services such as Flickr and Facebook. The extension also adds the Drag Drop Sidebar, so you don't have to switch to your file manager to locate the files you want to attach. In Firefox, when you choose View | Drag Drop Sidebar, you can pick the file you need without leaving the convenience of your favorite browser. If you had to choose only one extension to take with you on a desert island (provided you have an Internet connection and are allowed to take your computer with you), Morning Coffee  should be it. 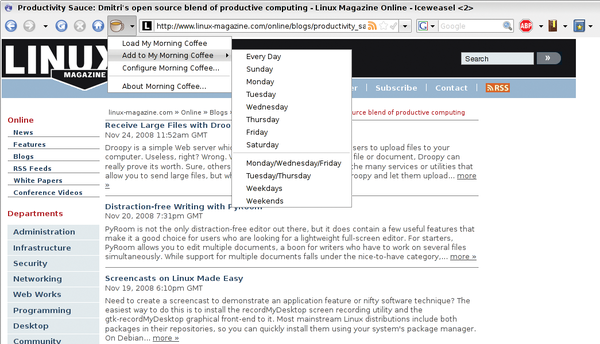 The basic idea is pretty simple: With this extension, you can create bookmark sets for each day of the week and open them with a single click (Figure 2). So if you regularly visit Slashdot, Linux Pro Magazine, and other sites, you can add them all to a specific set and open them at once. The clever part is that you can add a website to a particular day. For example, if your favorite blog is updated on Mondays, you can add it to the Monday set and check it once a week. Figure 2: Read your favorite websites with Morning Coffee.